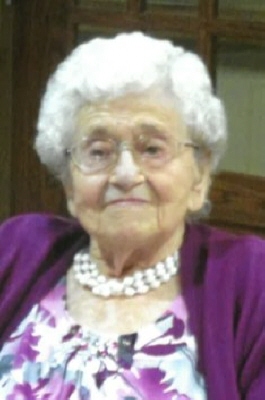 Virginia A. Kauper (nee Seibert), age 94 of West Bend (formerly Hartford), Wisconsin, passed away unexpectedly Thursday, March 14, 2019 at Cedar Community Nursing Home. Virginia was born June 11, 1924 in Knowles, WI to Caroline (nee Zwirlein) and George Seibert. She was united in marriage to Arnold E. Kauper on June 5, 1943 at St. Kilian Catholic Church in Hartford, WI. Virginia enjoyed cooking, baking, especially pumpkin pie, playing bingo, and doing embroidery. She had a very strong faith and loved to be with family. She is preceded in death by her parents; parents-in-law, Frank and Catherine Kauper; her beloved husband, Arnold; dear son, Robert; cherished granddaughter, Amy; dear sisters, Wynelda (Roland) Pieper and Lorinda (Vilas) Walters; dear brothers, Lester (May) Seibert, Clarence (Audrey) and (Angelina) Seibert, and Arnold (Patricia) Seibert; dear siblings-in-law, Orlinda (Alois) Beine, John (Ann) Kauper, Herbert (Anna) and (Dora) Kauper, Norman (Shirley) Kauper, and Arnold Schmidt. A Mass of Christian Burial for Virginia will be celebrated Tuesday, March 19, 2019 at 6:00 p.m. at St. Kilian Catholic Church (264 W. State Street Hartford, WI 53027) with Fr. David LaPlante officiating. The Kauper Family will greet relatives and friends at the church on Tuesday from 4:00-5:45p.m. Interment in St. Kilian Catholic Church Cemetery, Hartford, WI. Virginia’s family would like to extend a special thank you to the Cedar Community (sunrise unit) of West Bend for their loving care and support. To send flowers or a remembrance gift to the family of Virginia A. Kauper, please visit our Tribute Store. "Email Address" would like to share the life celebration of Virginia A. Kauper. Click on the "link" to go to share a favorite memory or leave a condolence message for the family.